Microsoft Made Pricey New Surface Books, Including a Giant One—They Seem Nice! Microsoft is finally dragging its ambitious Surface Book line into the present day, refining the striking design and making this a laptop you can covet for reasons besides that funky hinge. The surprise launch of the original Surface Book back in 2015 might have left critics thunderstruck, but it hasn’t transformed the computer market like its slimmer sister, the Surface Pro. 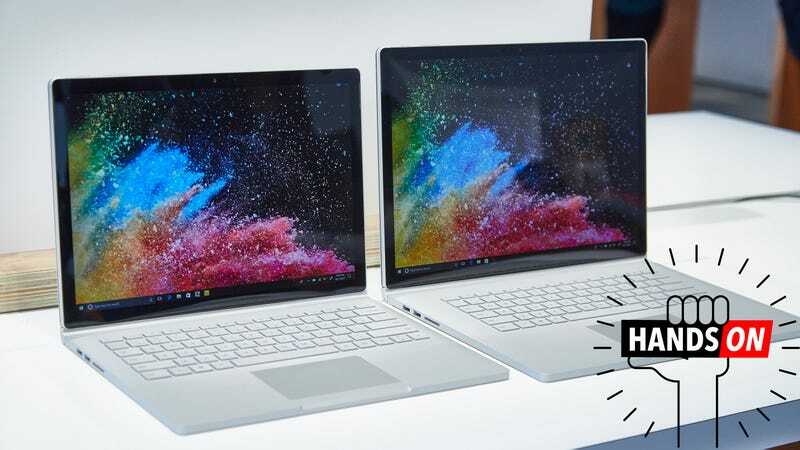 Instead, the 2-in-1 stands boldly on its own, iconic in its hinge design, outrageous in its price, and with the new Surface Book 2, potentially light enough to be a true contender to the MacBook Pros, and Dell XPSes, and HP Spectres of the world. The vents look kind of cool, and the Surface Book designers take advantage of the fact that the laptop lid doesn’t need to lie flush against the keyboard. The first thing you’ll notice is that there are two Surface Books now. A 13.5-inch similar in size and shape to the original, and a larger 15-inch version for people who demand a little extra power and desktop space (and are still okay with a big honking hinge). The other major difference you’ll notice at a glance are the fan vents above the keyboard, which are there to cool the discrete graphics card in the devices. The 15-inch packs an Nvidia 1060, while most models of the 13.5-inch have an Nvidia 1050. These GPUs won’t let you run Rise of the Tomb Raider in 4K at max settings, but they’ll be more than enough for decent gaming and will be a marked improvement over the super slow, “custom” discrete video card found in the original 13.5-inch Surface Book. The 15-inch is no thicker, but a lot bigger. A single model of the 13.5-inch Surface Book 2 lacks the vents as it has no discrete GPU. It’s also a little slower, running an Intel 7th Generation i5 processor, while every other version of the Surface Book 2 will have a faster 8th Generation i7. And you would think, as I thought, that a laptop that jumps ahead two generations (the original Surface Books ran 6th Gen processors) would be way heavier, particularly as the Surface Book stores all of its guts—with the exception of the GPU—behind the display. And yes, when keyboard and display are married together the i5 Surface Book 2 weighs in at 3.38 pounds, .04 pounds more than the current i5 Surface Book. But that weight is balanced for once. The 3000 x 2000 display on the 13.5-inch and the 3240 x 2160 display on the 15-inch are real pretty. The pen is actually thicker than the display itself. The display is fully reversible if art is your bag. There are no fans in the display, or huge batteries (at a press event, Microsoft claimed about 5 hours of battery life for the display alone, while Panos Panay, VP of Microsoft Devices, claimed 17 hours with the base). Now when you flip the laptop open, it doesn’t strain under the weight and tilt back. The display alone feels almost impossibly light. The 13.5-inch version weighs just 1.59 pounds, while the 15-inch version weighs 1.8 pounds. (Compare that to the 1.7 pound Surface Pro.) I walked around with the top of the huge 15-inch Surface Book 2 and never felt like it was too monstrous to hold—even if 15 inches is enormous compared to the displays of other 2-in-1s. Yet the most surprisingly exciting aspect of the Surface Book 2 is that it doesn’t require a stupid Surface charger to charge. As someone who hates, with a fiery passion, that little charger you have to slip into its slot every time you want to charge a Surface Pro, Laptop, or Book, I was overjoyed to learn that the new USB-C port next to the charging port handles both power and data. That means you could have an inexpensive USB-C charger at work, and leave the Surface charger at home—or vice versa. Computer running low and all you have is your buddy’s phone charger? You’re okay. You could probably snag some extra juice! It’s a big deal, and between it, the updated guts, and the range of models being released, this feels like a genuinely compelling attempt at a cool, if pricey, laptop to compete against other premium books. It might not slide into a bag as neatly as a MacBook Pro, but it makes a pretty good argument for carrying it around anyway. Speaking of the MacBook Pro, the Surface Book will command a similarly high price tag when it goes on sale November 9. The least powerful 13.5-inch Surface Book 2 will start at $1500, with the 8th Generation machines starting at $2000. Meanwhile, the 15-inch Surface Book 2 will start at $2500. That seems outrageous when you look at all those cheap laptops out there, but it’s right in line with the premium players from places like Apple, Dell, and HP. This time around, at least, it seems the slick 2-in-1 might ask for a little less compromise than before.